I stepped outside of my gaming comfort zone when I bought Hand of Fate back in spring 2015. Furthermore, this is a game I purchased purely on the strength of watching a couple of "let's play" videos on You Tube. I don't usually gravitate towards card based video games, although I have always played traditional card games such as Cribbage and Nine Card Brag with my family. If I ever choose to gamble I tend to favour Blackjack. 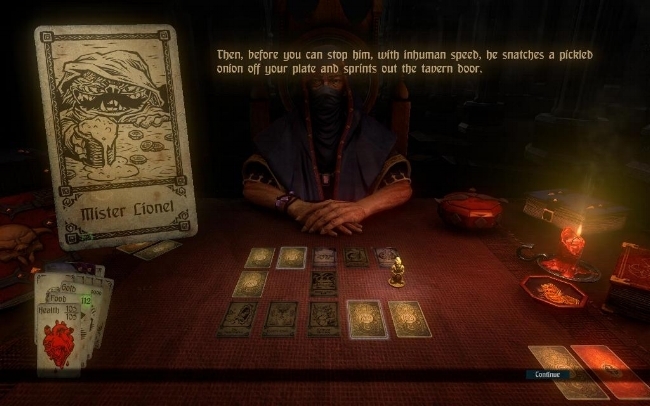 But Hand of Fate with it's curious hybrid mixture of deck based gaming, RPG action combat and story driven narrative just seemed to strike a chord with me. It is definitely more than the sum of its parts. Hand of Fate includes several other mechanics that would usually deter me from purchasing such a game. Despite there being an element of skill and common sense required to play successfully, random chance also has a role. Curses can be dealt and slowly sap your health, draining your gold and food supply. Therefore, there is scope to fall at the last hurdle simply by starving to death or by being unable to purchase a superior weapon. Usually I would balk at such mechanics, yet it seems to work well here within the context of the game and its own internal logic. There is also no specific save facility, so death results in an entire "hand" of card being replayed. Yet this feels like a credible approach to a deck based game. The actual combat that stems from the card play itself. It is straightforward and is best played with a game controller. You need to be able to dodge attacks and build up your hit count to unleash superior skills. Sometimes the animation can be a little choppy and the camera views a little counter-intuitive but overall it works and adds to the flow of the proceedings. Then there is the character of the dealer himself, who is very entertaining. The voice acting here is good and enhances the atmosphere. The game soundtrack is relatively low key but is used effectively. Some of the cards in the deck are quirky and enliven the story. I look forward to an appearance by Mister Lionel and his inevitable theft of one of my pickled onions. Hand of Fate does have quite a punishing denouement and I have yet to beat it, yet I am finding that this is an incentive rather than a deal breaker. I am pleased that this experiment in trying something new has worked out well for me. It has also once again shown the importance that You Tube and Twitch have upon my (and others) purchases. It is also interesting to see such a casual and mainstream gamer as myself, beginning to look outside of the traditional market in to the independent sector, for more of my entertainment. Despite my love of franchises, I am finding more enjoyment and engagement with these smaller more niche market titles. As a result, I am increasingly looking beyond the boundaries I have previously imposed upon myself.